Library moves can range from 120 linear feet to over 9 miles of product. The product can be files, books, periodicals, CDs and DVDs. The one thing they all have in common is the Librarian’s desire to be able to find his/her product the minute the move is completed. In order to accomplish this goal, a plan/process must be put in place well before the first library cart is ever delivered. There are numerous items that must be known in order to make this plan. Is the new configuration going to mirror the current configuration; or are they going to allow room for growth? If so, how much room are they going to allow? One shelf per unit; or a predetermined number of inches per shelf? Are they obtaining new shelving/stacks; or are they going to reuse their existing shelving? If it’s new shelving, are all the shelves the exact same width and depth as the existing shelving? Who is going to place the product on the library cart and remove from the cart to its final destination on the shelving? Who is going to label the library carts and the books once the plan has been established? What is the width of the aisles between shelving at both locations? This is important to know, as this will dictate the amount of labor needed to pack and unpack the library carts. Once these questions have been addressed and clarified, the plan to successfully complete the move can be made. 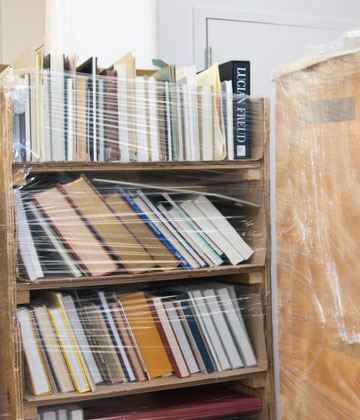 It is highly recommended that both the client and the moving company have Project Managers on site during the actual physical relocation of the library. Careful, thoughtful prior preparation is essential for a successful library move. Exact details need to be ironed out prior to the commencement of the move. Picking a mover with past, proven performance and experience can make your library move seamless.